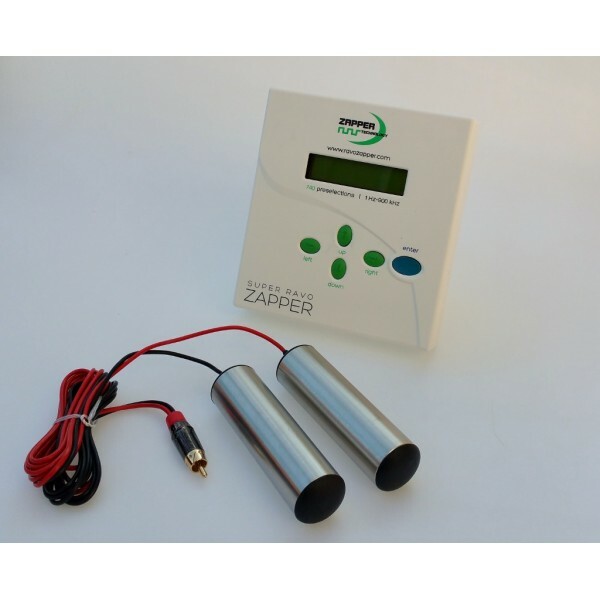 The Super Ravo Zapper is a new, easy to use experimental frequency generator from Czech Republic . It took team of engineers two years to develop this device. It is a multifunctional, programmable square wave frequency generator with adjustable voltage output . It comes with preloaded programs with the capacity for 740 more user defined sets. The Super Ravo Zapper is portable and rechargeable with a built-in battery that lasts 10 to 12 hours. It has an output level checker, verifies that proper conductance is being made between the electrodes, has a short circuit protection, and can charge from 110/120 or 215/230V electrical outlets for worldwide use. The backlit two-line LCD display shows time to go, actual frequency values, output voltage level, battery status, etc. There is sound signalling of most of the functions, which can be disconnected if desired. There is also signalling of a short circuit or the disconnection of the electrodes. The Super Ravo Zapper has an accuracy of 0.001Hz . Unique feature is in that it automatically sweeps around the set up frequency by this increment within the programmed range. This feature is making it a revolutionary advanced frequency generator for any experimentation ! The original programs are all stored in non-volatile memory and can be restored anytime. Programs beep – to let you know the status as it is running. The box contains the zapper, power charger, cables, USB cable for connection to PC,food grade stainless steel handholds, and a user manual – all in a custom made padded case. Get the Super Ravo Zapper today and enjoy experimentation ! – setting the time of activity for 1min – 99 hour.